1935 Morris Briggs became infatuated with planes when he was eight years old. His grandfather was driving him outside of town and he saw a barnstormer in a field. Morris’ grandfather was not impressed with planes as he thought they provided no useful purpose and were unsafe. Morris was finally able to convince his grandfather to stop so he was able to see the barnstormer plane but his grandfather was not about to pay the fee for a ride. 1942 Morris makes his first flight. Morris had a summer job at a YMCA camp which had a pool where Navy Pilots studying at a nearby college would come to swim. At the end of the camp, all the camp staff was treated to airplane rides in the Piper Tri-traveler by the Navy. Briggs found more inspiration from veteran and author Colonel Bernie Lay, Jr. who wrote the books I Wanted Wings and 12 O’clock High. 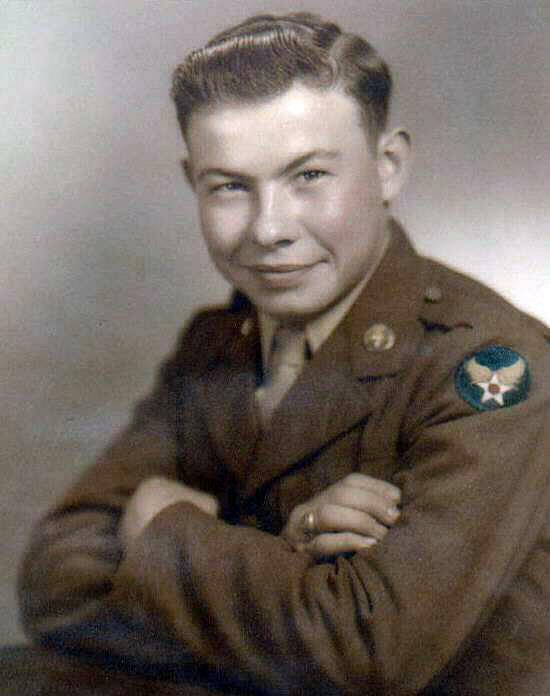 7/17/1944 Morris always wanted to be an Army pilot and enlisted in the Army at the age of 17. 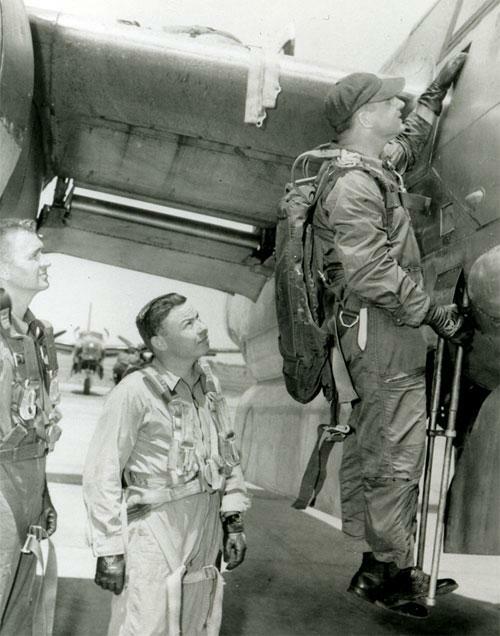 He qualified for flight training and went directly into the reserves. 1945 Briggs is called to active duty and reports to Kessler AAB, Mississippi for what he thought would be flight training; however, World War II soon ended and the Army Air Corps found itself with a surplus of pilots. 35,000 cadets were washed out of flight training for which Briggs had qualified as a bomber pilot. 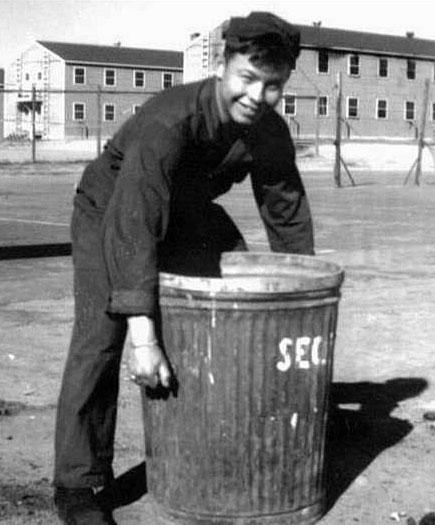 Morris was then sent to Lowry Air Force Base in Colorado to attend clerk typist school. He had advanced typing skills so was able to accelerate the process by being sent to an administrative school which was unusual for a private. From Lowry AFB, Morris was given orders to report to the overseas replacement center at Camp Kerns in Utah for further assignment. 1946 Dwight D Eisenhower came to Morris Briggs’ base at Fort William McKinley. Briggs was impressed by Eisenhower and thought he was a very competent General. 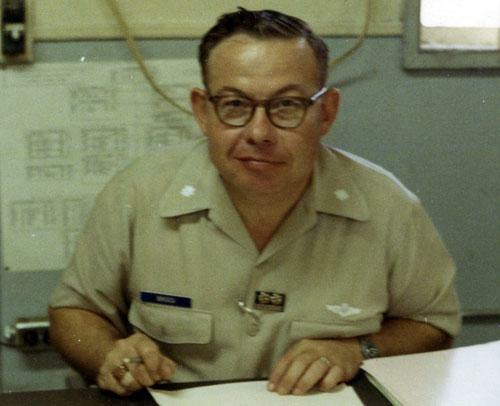 3/22/1946 Morris Briggs leaves California on a SS Seacat troop ship and reports to the Philippines for administrative duty in the 13th Air Force. Briggs was empowered by being given the responsibilities of being in charge of all correspondence that came into the headquarters. 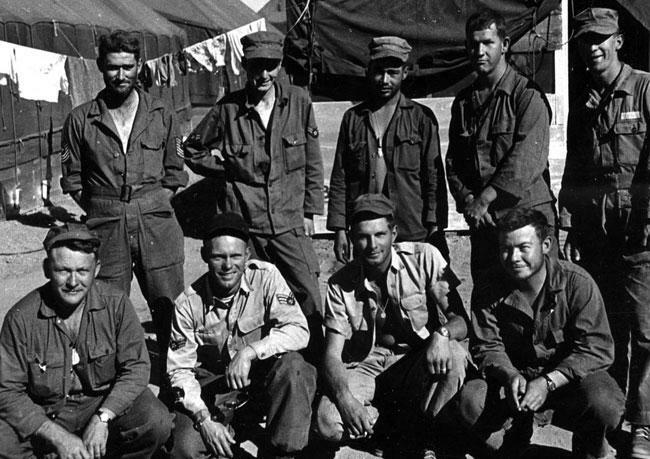 Briggs also processed all the paperwork for the repatriation of Japanese prisoners of war confined at Fort McKinley. 5/1946 Briggs was stationed at Fort William McKinley just outside of Manila. Morris says that at this time and location, there were not too many ill sentiments towards the Japanese among the Americans and most people wanted to move on. In many places post-war occupation duty was relatively easy, but in the Philippines it was still essentially a warzone. The Hukbalahaps were an underground group that wanted to be represented in the coming elections; however, General MacArthur would not allow them to gain a presence because of the threats and fear of communism. The Huks attacked the American base at Fort William McKinley several times, even attacking one time by invading the base and killing the soldiers in the first five bunks in one of the barracks. At this point, Morris was in the fifth bunk at the adjacent barrack. Briggs often was called up for perimeter defense with his M1 carbine for short fire fights with the Huks. 2/1947 Morris Briggs came home from the Philippines on the General Hausey. Briggs got a fierce attack of appendicitis which flared up a few times while on his way home. The ship also struck a World War II mine which blew a large hole in the ship, unfortunately a number of sailors lost their lives as a result of the explosion but the ship was able to continue with the survivors. 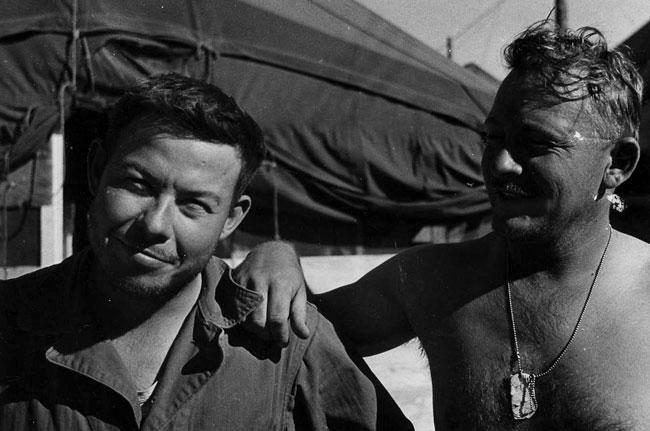 Briggs was supposed to be offloaded on Guam for his appendicitis; however, a typhoon came up and made the offloading of any soldiers impossible so Briggs had stay on the ship. The entire trip took four weeks while it was only supposed to take three weeks. 3/12/1947 Morris Briggs was discharged from the Army. Briggs was eager to get back to school and wanted to complete his college right away even though he had some offers for undergraduate navigation school. 6/1951 Briggs enrolled in the ROTC program clinging to his dreams and aspirations of becoming a pilot. When he went on to Enid, Oklahoma for a flight physical, he was devastated to discover he could no longer pass the eye test. He then had the opportunity to become a navigator and he applied for it. To Briggs’ disappointment, he was sent to Wichita, Kansas to do adjutant work, but after a couple of weeks he was excited when his mother called and told him he received flight training orders. Briggs still does not know why he was issued two orders, but he was not going to argue. Luckily, flight training took priority and he was off to Houston, Texas for Ellington Air Force Base. 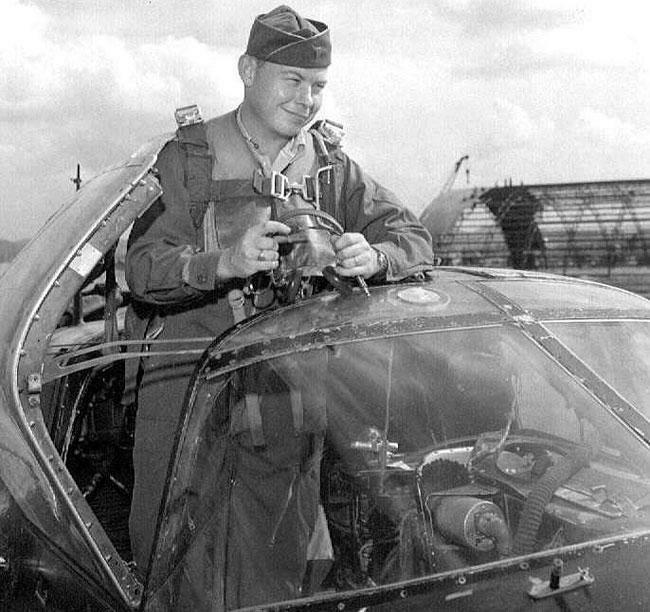 9/1951 Originally Briggs was assigned to the B-29 airplane but his orders were changed to photo reconnaissance training. As a navigator, Morris was assigned to the A-26/RB-26C Invader built by Douglas in photo reconnaissance in South Carolina. 1952 President Truman called the Korean War “a police action,” while Briggs attests that he was definitely not standing on the corner directing traffic. The Battle of Chosin Reservoir is a good example of where the battle was fierce and unfortunately 20,000 American troops were attacked by 100,000 Chinese during combat which ensued in well below freezing conditions. If not wounded or killed, most of the American forces suffered severe frost bite. 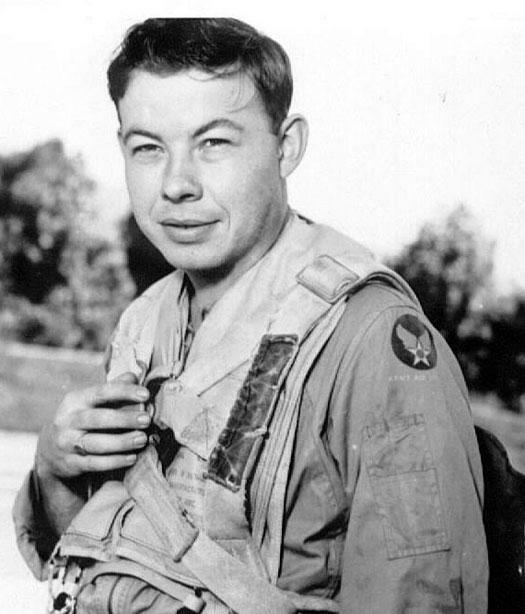 3/1952 Soon after his training was complete, Morris Briggs was sent to defend the Stars and Stripes in the Korean War, where he flew 50 combat missions. The RB-26C did not have any weapons nor did it fly as a squadron and it flew at night. Their motto was “unarmed, alone, and unafraid.” Morris’ invader was a converted light bomber that had all of the guns removed and replaced with camera equipment. The bomb bay was still operational as the camera’s need light in order to work. Morris would drop phosphorus flash bombs that made night look like day and then take pictures of Korean placements. The bombs were two million times the candle power light and were built into a 100 pound GP bomb casing but weighed just 42 pounds, and were dropped in a series for the strategic camera exposure. 4/1952 Flying the RB-26C, there were always three crew members including the pilot, the photo navigator/bombardier, and the dead reckoning navigator; Briggs was the photo navigator/bombardier. Briggs would take photos from the nose of the plane. The RB-26C cruised at 310 mph and had a maximum speed of 410 mph which was achieved many times when trying to break a radar lock. The RB-26C was equipped with the marker beacon system which assisted in instrument landings. This device also doubled as an advanced warning device because when a radar lock was made, the light would flash on the instrument panel. The typical mission lengths would range between two to five hours. 5/1952 Briggs had a few missions were he did not think he was going to come home alive. They would try to photograph all the air fields, bridges, and roads once a week in the Pyongyang area to keep an eye on what the North Korean army was doing. The Koreans even had an exercise where they would repair a bridge then submerge it when it was not in use; however, the photo interpreter could spot and reveal these things. Typically, photos were taken at 5,000 ft. above the ground so that one square foot of photo would equal one square mile which made for a hot ride flying over enemy targets armed with anti-aircraft guns, fighters, and search lights. Some mountains were higher than 5,000 ft. and in the dark they were very hard to see flying at 280 mph. 6/1952 Morris Briggs was flying a radar calibration mission and lost both engines while flying at 18,000 feet. At the same time, they were jumped by a flight of night fighters. 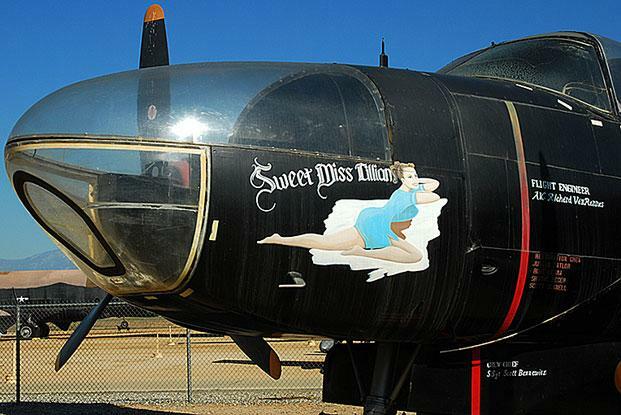 The RB-26C was a fantastic airplane, but it flew like a rock when it did not have power. Before this, the pilot’s microphone came apart and he could not talk so Briggs had to plug in his. The second navigator then let everyone know he did not stow his one man dingy and therefore, they could not eject from the plane. They decided to go in for a crash landing and when at 1,000 feet the pilot tried the engine again and it started up right before going down. Radar then notified them there was a flight of night fighters on their six o’clock position and closing fast. Somehow Briggs’ plane was not picked up and they made is safely back to base. He still is not quite sure how, but someone up there must have been looking out for him. 7/1952 Morris took some photos of a Korea supply depot which was full of activity and came as a shock to the brass as no one knew it existed. The Air Force quickly sent in some B-29’s to eliminate it. Morris was then granted the mission to take damage assessment photos. These photos taken by Morris Briggs were on exhibit at one time at the United States Air Force Museum in Dayton, Ohio. 8/1952 Morris Briggs was flying through overcast conditions over Pyongyang when all of a sudden a cluster of four rockets came screaming up at the RB-26C. This is the first time Briggs’ squadron had seen rockets being used. Very shortly thereafter, another set of four rockets came screaming through the clouds which were followed by two more salvos of four each, luckily the pilot was able to make the correct evasive moves and get Morris and his crew all back to safety. 12/12/1952 First Lieutenant Morris Briggs finishes up his mandatory 50 missions in the Korean War just before Christmas; however the challenge remained as to how he could actually get back home from being on the other side of the world in the midst of the Korean War. 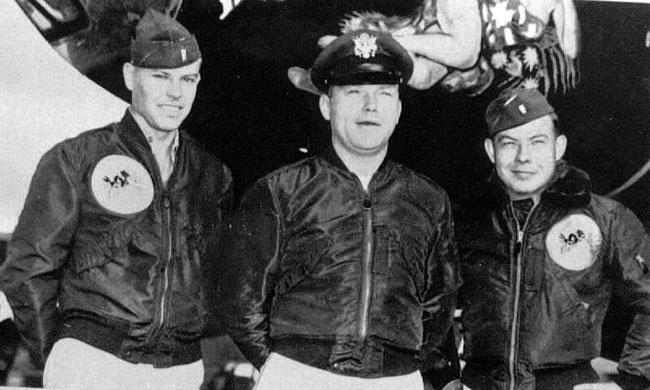 Morris Briggs’ plane home was commandeered for other people but fortunately he was able to get a ride on a new airline called the Flying Tigers, a group of pilots who were some entrepreneurs from World War II. Due to the extra day gained from crossing the International Date Line, Morris made it back home to Kansas City at 4AM on Christmas day where his brother picked him up. 12/30/1952 Morris was a given a 30 day leave but he declined it as snow was waste deep and he wanted to move on. 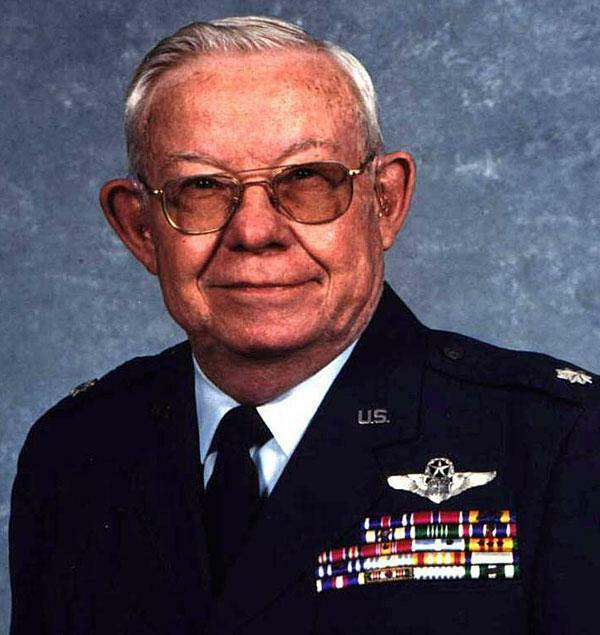 Morris was transferred to the Strategic Air Command in the Air Refueling division. Morris would be flying the Boeing KC-97 Stratocruiser which has a double fuselage. This was the refueling plane used until the KC-135 came on line. 1954 Morris Briggs completed an assignment in Newfoundland. 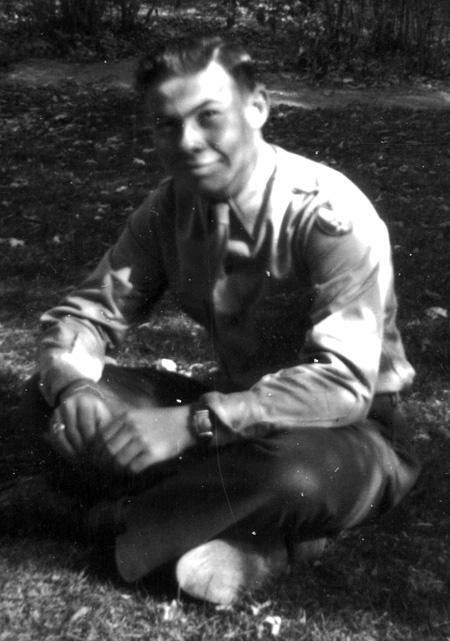 1955 Morris Briggs’ unit was going over to England for three months; however, he could not go because he was at the end of his four year commitment. Thus, Morris extended as a career man and went off to England. 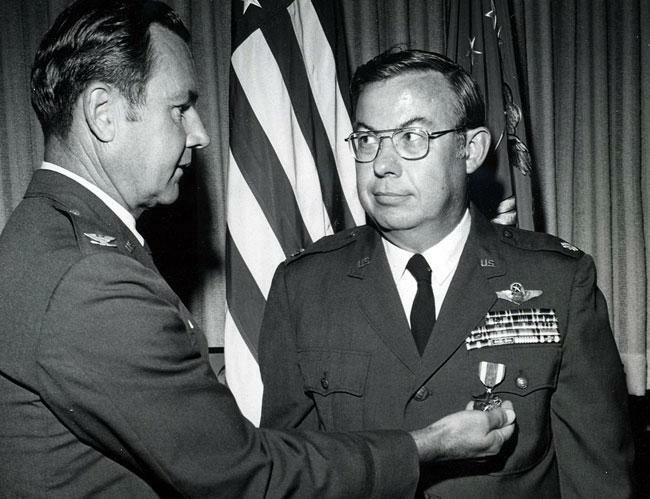 About a year later, Briggs was offered a regular Air Force commission. Units would rotate deployments in support of NATO every 90 days. In England, Briggs went to RAF Station Brize Norton. Morris Briggs was a crew navigator then later an instructor. Refueling planes in the air became old habit but never easy; each tanker navigator would bring opposing planes together until they were close enough so the boom operator could bring the plane being refueled into the final envelope. The KC-97 had a flying boom. The B-29 was fueled by cross connecting hoses and could not use the boom which made it difficult; the B-50 did have a refueling receptacle along with the F84, B-47 and B-52. The B-47 would actually slow down when refueling to stall speed whereas the B-52 had an envelope that pushed out in front of the plane which increased the KC-97’s speed. The KC-97 crew consisted of an aircraft commander, co-pilot, navigator, flight engineer, radio operator, and two boom operators, later they cut two of the positions. Briggs logged 3,500 hours in the KC-97 with an average mission time length from 10 -16hrs. 1955 Morris Briggs was promoted to Captain which was a year ahead of typical advancement because he received a spot promotion while serving in Korea. 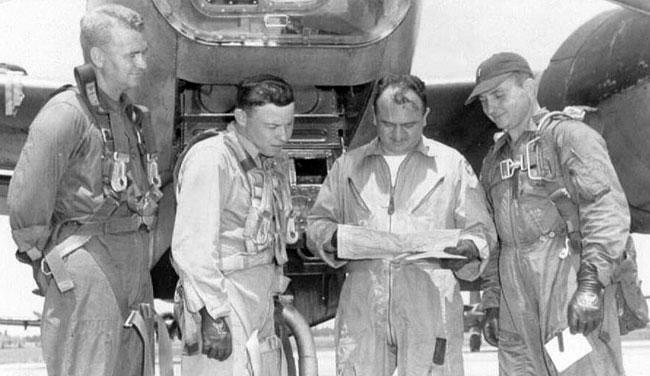 Morris became a squadron navigator until 1961. 1956 Morris Briggs was stationed at the RAF Station Upper Heyford, Oxford, England during the Suez Canal crisis. 1957 Morris Briggs was stationed at the RAF Station East Kirkby England. 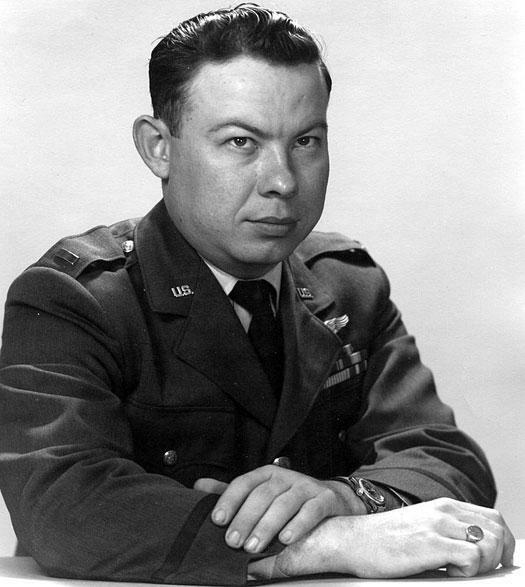 1963 Morris Briggs was selected to attend Air Command Staff College. Morris was promoted to the rank of Major while at Command and Staff College. 1965 Morris Briggs is promoted to the rank of Lieutenant Colonel while assigned as the Professor of Aerospace Studies at Otterbein College. 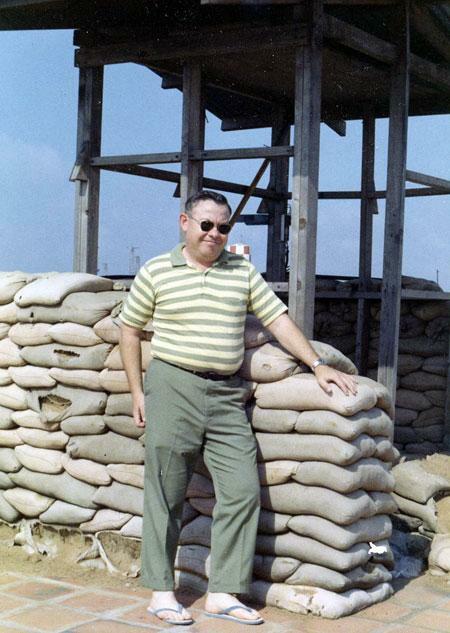 Morris served in Vietnam as an advisor to the Vietnam Air Force at Tan San Nhut Air Base for one year. The Vietnamese were being sent to the United States for engine mechanics training and the process took 18 months, mostly because the technical words of the course did not exist in the Vietnamese language so they were taught English. Briggs was part of a group that decided to add the new words to the Vietnamese language and train them abroad; this learning tool they created was able to shrink the pipeline and learning curve to 6 months. In order to make this possible, new training manuals had to be created and printed in Vietnamese so that no one had to learn English which was quite an endeavor. The Air Force had a 22-45 rule which meant if you had been flying for 22 years and were 45 years old you did not fly anymore, so according to this policy Briggs flying was pretty much in the past. The Tan San Nhut Air Base would often be rocketed so Briggs was never too comfortable at the air base. At one time, the hotel Briggs was staying at had the windows of his room blown out by an attack on a helicopter pad nearby. 1965 Morris Briggs after wanting to be a pilot his entire life finally did get his pilot’s license. He received a FFA commercial license with instrument ratings along with FAA certifications as a flight and ground instructor. 1970 Coming back from Vietnam, Briggs joined a think tank group called Aerospace Research Institute at the Air University at Maxwell AFB. Briggs was a strategic analyst tasked in writing research papers for the staff in Washington DC. After a year, the think tank was deactivated and Briggs was reassigned to the Air War College. 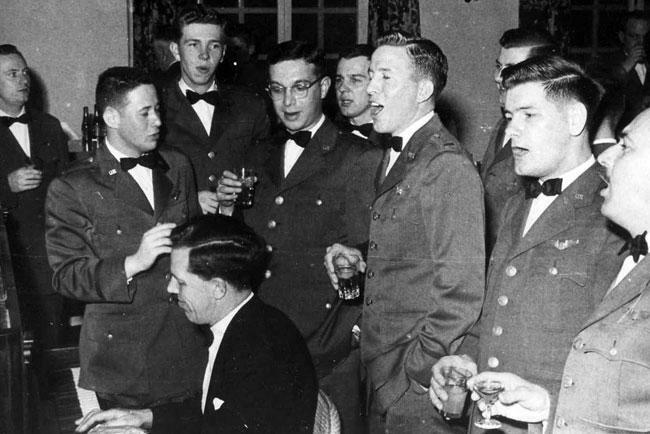 Morris Briggs became the registrar for all Air Force and Army reservists enrolled in the off campus Air War College Associates program. 6/30/1973 Morris Briggs retires after 28 year of service. 1974 Morris Briggs made the decision to retire from the Air Force when a new endeavor and opportunity opened up as he was selected to become the Dean of Admissions at Otterbein College in Westerville, Ohio. 2004 Morris Briggs was inducted into the Ohio Veterans Hall of Fame. 2007 Briggs pilots his last aircraft, a WWII T-6 trainer, at the age of 80. ROTC flight from Kansas State, 1950, San Antonio, TX. Kansas State ROTC flight at summer camp, 1950. 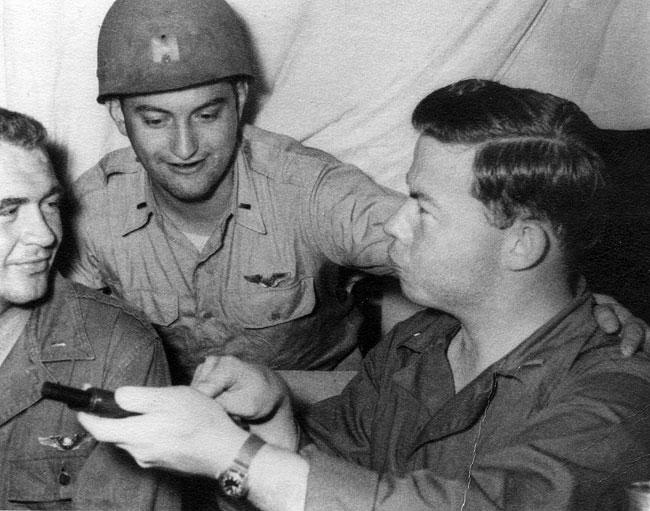 Clowning Around: Morris Briggs showing the working of a pistol to Dave (left) and Charles (center). Morris Briggs standing in cockpit of RB-26C at Kimpo Air Base, Korea, 1952. 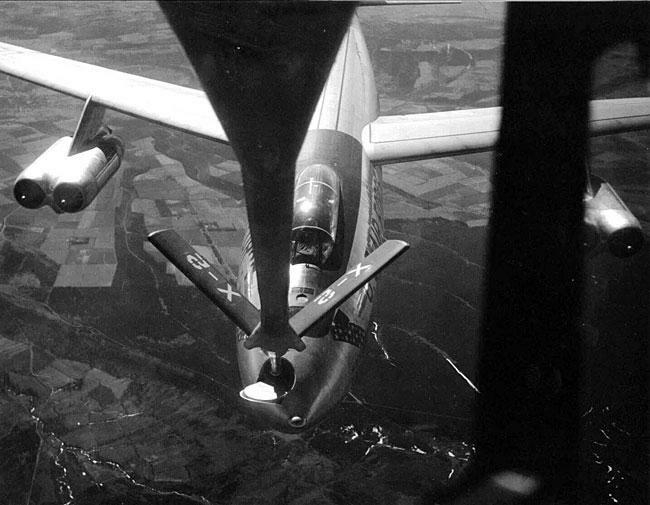 Pix taken from chase airplane showing B-47 taking on fuel from KC-97. 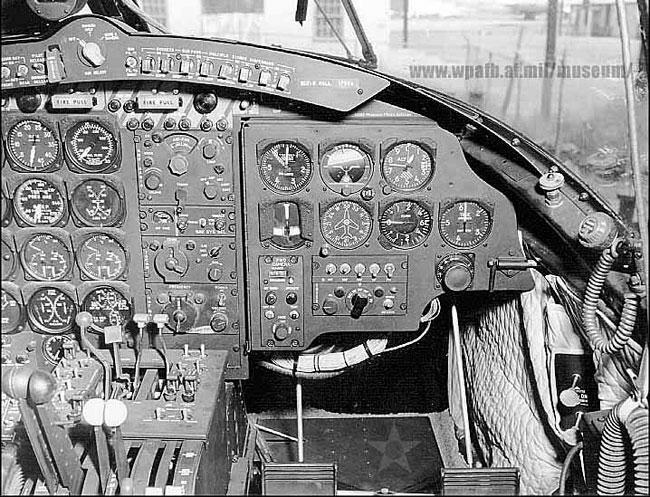 The right side of the cockpit of an RB-26C aircraft. Tunnel to the nose section is below the instrument panel. 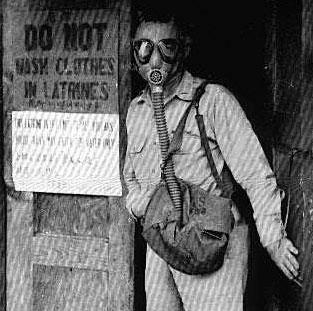 Clowning around: Latrine was often out of order but never without odor, so Briggs came prepared. Briggs office, Air Force Advisory Group, Vietnam, 1969-70. 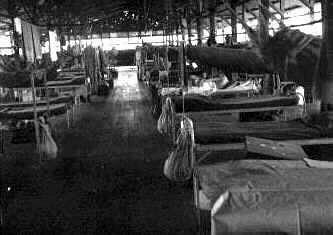 Interior of barracks, Ft. William McKinley, PI 1946. RB-26C, Air Force Museum, Dayton, OH. Briggs with Capt. Porritt, Stead AFB, NV 1953. He’s telling me we aced our survival course. 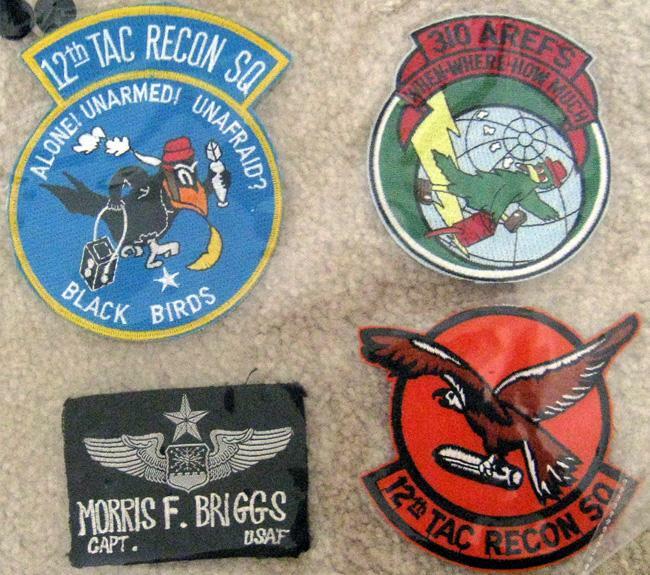 12th TAC Recon Squadron and 310 AREFS patches. 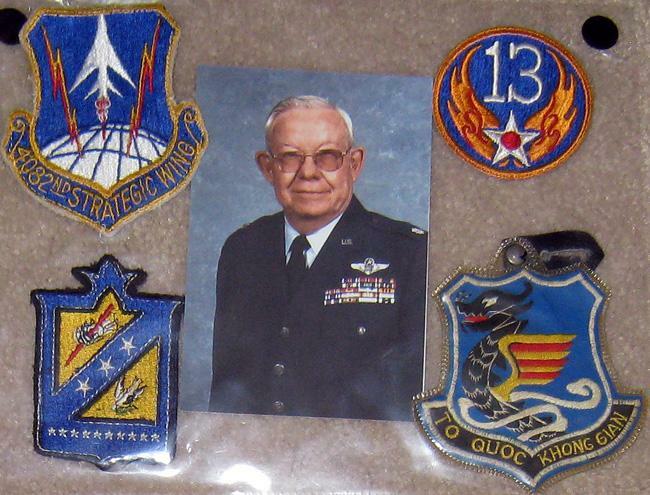 1082 Strategic Wing and 13th Air Force patches. L/R, T/B. Lt Colonel, hat insignia, Lt Colonel Vietnam. Later navigator wings, early navigator wings. 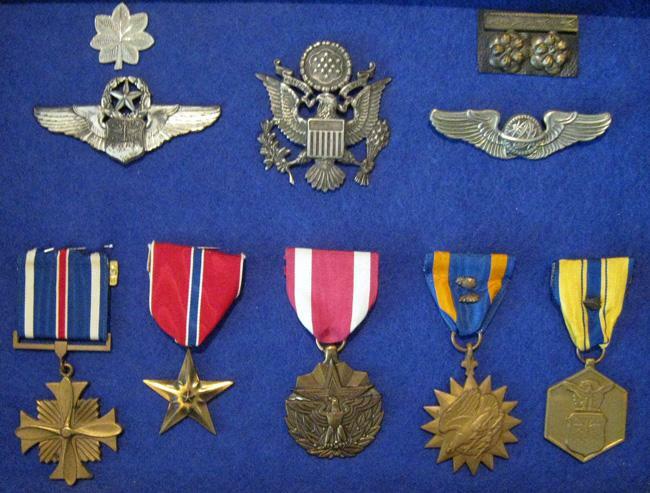 Distinguished Flying Cross, Bronze Star, Meritorious Service Medal, Air Medal with two oak leaf clusters, Air Force Accommodation Medal with oak leaf cluster.